Genom att köpa denna produkt kan du samla upp till 4295 bonuspoäng. Din varukorg kommer att generera 4295 bonuspoäng som kan omvandlas till en värdekupong på 42,95 kr. Optimized suspension arm holders on the rear axle, front / rear for perfect toe and anti-squat adjustments including inserts. This offers much more adjustment on the rear axle which results in a better ride. 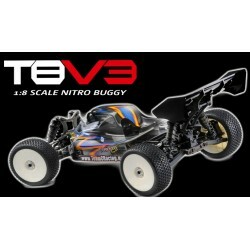 The T8E V3 is equipped with a newly designed motor mount. The center of gravity is now lower, which results in that the T8E V3 is more stable on the track.